Thanksgiving is right around the corner and it's time to post my holiday wish list. Orvis Windproof Fleece Hat - My oldest son is now going to college in Plattsburgh, NY - right on Lake Champlain! I am planning an ice fishing trip with my two boys this winter and we're going to need some very warm hats. The Orvis Windproof Fleece Hat is exactly what I'm looking for. This hat blocks out the wind with two full layers of polyfleece and a laminate layer in between, and brushed polyfleece ear flaps to keep my ears warm and still be able to hear my sons yell "Fish on!" GoPro Chest Mount Harness Chesty Kit - I love my GoPro camera. It allows me to record awesome point -of-view videos of everything we do from boating, skiing, swimming, biking, and of course fishing. 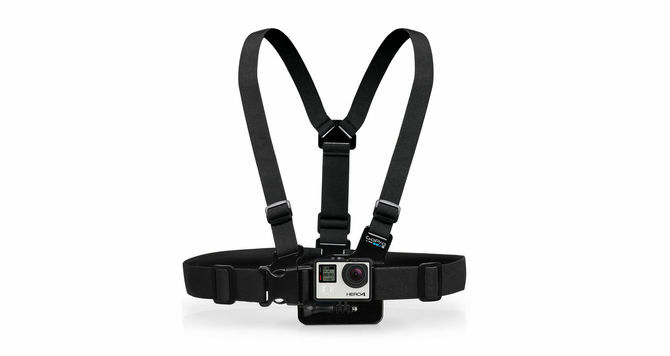 The GoPro Chest Mount Harness Chesty Kit will allow me to capture immersive videos and photos from my chest. and it's fully adjustable so it will fit over anything I'm wearing. Shimano Spheros Spinning Reel - I've been looking to upgrade my surf casting tackle for some time now. This Shimano Spheros Spinning Reel is just the answer. It has a waterproof drag, A-RB bearings and cold forged aluminum spool. And not only can the Spheros take it, it can dish it out too, with up to 44 pounds of drag! It holds 600 yards of 50lb test, and with 38 inches per turn, I'll be able to drag those striped bass up to the beach so fast, they won't know what hit them! Quantum Controller Combo - When summer comes around it's time to take the boys out party boat fishing for some bluefish, striped bass and fluke. The Quantum Controller Combo is perfect. The reel has a composite frame and sideplate with a one-piece metal foot, and a 2-bearing system with Carbon Fiber Drag. The two piece Rod is 6'6" - just the right size for partyboat fishing. The oversized handle is aluminum, the clicker is extra loud and the spool is high capacity. Orvis Gale Force Backpack - This highly durable and weather resistant backpack was designed with fishing in mind. This would be perfect for carrying all or our gear when we go salmon and trout fishing in Upstate, NY. It features a unique polyurethane-coated nylon fabric, is heat/RF welded and combined with water-resistant, noncorrosive YKK zippers. Contoured, padded shoulder straps adjust for perfect fit and an adjustable sternum strap for secure fit. Two compartments with interior pockets for ample storage and organization of your gear. Thick foam-padded back panel with built-in channels for air ventilation. It also features buckle attachments for chest-pack compatibility—attach an Orvis chest pack to the front shoulder strap for use while fishing or haul it on back panel.